Excited to see adult ButterRum Verde! ❤️ Happy Friday! Yay! So excited for you ❤️ Can't wait to see her! I see a pumping abdomen! Iris will molt soon! Moult .. The rest of the anglophone world. How does this work @Graceface? My nymph already has a lot of green. She may lose it? Well, she just molted, right @hysteresis? Color post molt takes a few days to sort itself out. Iris didn't turn green until L6. Bellatrix was green as of L4 and stayed that way all through her molts. It depends on a lot of factors, including genetics, humidity, temperature, and perch coloration. I would say if she is green now, she will probably stay green. I agree with @Graceface! Remember ButterRum-Verde turned green a week after her molt but only after she was on a green perch and misted everyday multiple times a day. I think they change accordingly to what’s needed. When I got Iris, she was green but she has settled into a yellow green now. Many factors. Out of town for a couple days and left the ghosts on the house plant! They'll be fine! Might come back to three green ghosts! Found some of you on Instagram! 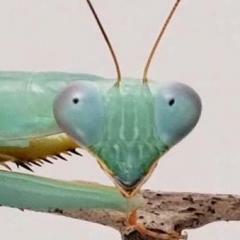 If you have a mantis or animal account let me know! Mama Hierodula is on her last stretch. She made her way to the ground and slowly making her way out. I pet her on the thorax and thanked her for being a good mantis friend and now I will allow nature to naturally take her away. Such a good little girlie! So sad! Auf wiedersien Mama Hirodula! Bought "Keeping the Praying Mantis" and excited for a relaxed Sunday evening! I'm learning lots from that text.